I have three boys so I'm kind of addicted to making pants. Especially when I get to use cute designer cotton prints to enhance the look of their pants and making them very one of a kind. So, to satisfy my pants making 'obsession', I'm now doing custom made pants for boys and girls of all ages - 0 months old babies to 8 years old children. This will also be my 1st step into making kidswear :). 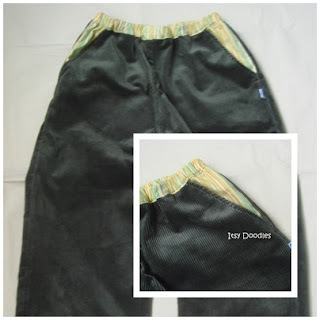 These four pants are samples for boys pants age 2 years and up. It can be either as shorts, three quarter pants or a long pants. 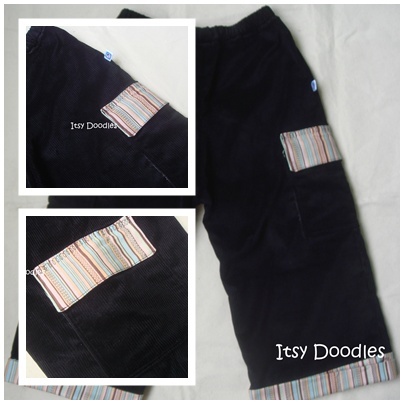 Itsy Doodles pants cut are Easy-fit and can be customise to suit your child(ren) needs - as a formal or a casual pants. Sample picture : Big boys 3/4 length pants made with Linen fabric in Grey. Added cargo/bellow pockets at front with fish prints on flaps and snap buttons for closure. Sample picture: 3/4 length pants made with Linen fabric in Grey. Looking for pants for babies? Click here for info on Itsy Baby Pants. Custom Order by Ida Mawarni.